Thread: so im going to hawaii..
anyone know about any good stops??? Give my friend Tangi a call. Tell him Dean from HPD sent you. He has ukulele's in all different price ranges. Another good thing is that you are buying directly from him and not through a retailer. Here is his website. hey Dino, is it cool if i give your friend a call too when i go? Hey guys can't have 2 out of 3 without the third person. ha .i am also going to be in waikiki I will be there on the 5th of april and looking to purchase a tenor .Do we get better deals for 3 ukuleles?? In Oahu, check out Good Guys Music & Sound, Dan's Guitars, & Hawaii Music Supply for a pretty good selection and great prices. Check out Ukulele Pua Pua at Waikiki for a pretty wide selection, although the prices are not as good (everything on Waikiki is expensive). Of course, you should also pay musicguymic a visit if possible. If you have the budget for a high end custom, pay Shawn Yacavone a visit. He's great. I was in Oahu this past January. My ukulele advantures during that trip could be read here. You might also check out Craigslist (if you have access to computer) and the local papers. There are several others who specialize in custom builds but here's a list of the ones often mentioned . . . BTW, they are all O'ahu based. Good Luck and have a fun. 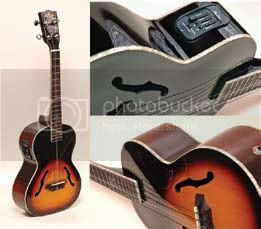 its a Kala KA-JTE2TS... its an archtop tenor kala... for 325... any thoughts? $325 is too much for that one. musicguymic has it for less here. And I'm pretty sure some of the music stores in Oahu actually has better prices if they got it in stock. You should shop around. yeah... i know its a bit much... but usicguymike isnt available until april 10 and i want the uke now so i wont have to pay shipping... other stores i went didnt have it in stock... plus the store is right by where im staying... but im going to the swap meet tomorrow to look around too... we'll see what happens..
Last edited by dafamcallsmebj; 04-04-2008 at 09:51 PM.